Brian Hugh Warner (better known by his stage name Marilyn Manson) (born January 5, 1969) is the lead singer and shock artist of the band Marilyn Manson, formed in 1989. In 1993, the band signed to Nothing Records after correspondance with Trent Reznor, who was impressed by their music. Reznor had a heavy hand in producing the 1994 record Portrait of an American Family and many members of Nine Inch Nails performed and co-wrote songs featured on 1996's Antichrist Superstar. Reznor also produced EPs, single tracks, and remixes in between these records. Reznor and Manson are rumored to have fought over control and musical differences prior to the recording of Mechanical Animals, causing a rift in their friendship and a series of media feuds, but resolved it prior to the "Starfuckers, Inc." video, which Manson appeared in and co-directed. The two performed the song live in New York City at Madison Square Garden on May 9th, 2000. However, recent interviews have indicated that the two are up to old tricks again. Question: Have you considered re-releasing any of your older albums with remastered tracks, b-sides, and other goodies? Antichrist Superstar turns ten years old next year. Is there any possibility of fans getting to hear an improved mix of this milestone album in the future? Manson: I'd like to say yes, but there’s a legal matter pending that I can’t say too much about. It’s very hard to believe this, but representatives from Nothing Records have indicated that they are not able to find, or have lost the master recordings to my first three records. It's not something that you would ever let happen in musical history. I would imagine something like that could only be intentional. If not intentional, it would have to be done only through complete disregard. Now that Nothing Records doesn't exist, I think there’s only one of two people responsible for that. Out of those two people, there's only one that really has an opinion of me that is voiced very often. This is a jab at Manson, who did a straight-forward cover of Depeche Mode's "Personal Jesus." "Personal Jesus" has been covered by numerous other artists including Johnny Cash. 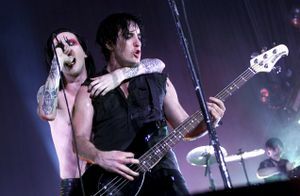 Manson singing "The Beautiful People" with Trent Reznor during Fragility v2.0 at Madison Square Garden on May 9th, 2000. The first sign of this reconciliation was Manson's presence and co-directing credit for Nine Inch Nails' "Starfuckers, Inc." music video. Later that year, Manson made a surprise appearance at Nine Inch Nails' concert at Madison Square Garden in New York City, joining the band at the end of "Starfuckers, Inc." before performing "The Beautiful People." The reconciliation did not last long, however, as soon after, they were once again exchanging barbs at each other through the press and their websites. In an interview in January 2011, Reznor was asked if he would ever work with Manson again. He responded by saying he's open to anything and that his former protégé “is a talented person” and that “we’ve had our problems, but I wear suits… I'm an adult now”. This page was last modified on 14 September 2017, at 21:30. This page has been accessed 89,209 times.